Philadelphus is a deciduous bush of the Hydrangeaceae family. A wild form of the plant in a wild look living in North America, East Asia and Western Europe. This plant is famous for its graceful beauty and pleasant aroma of flowers, conceding on these indicators only to roses and a lilac. Many years ago this plant served as a basement for a pipe core. This fact also affected a choice of the Russian name. And the Latin name, according to the most widespread version, came from the name of the tsar Ptolemaeus Filadelf, who was interested in the world of nature. Some researchers see in the name "philadelphus" two Greek words: "phileo" that means "to love" and "adelphos" that means "brother". 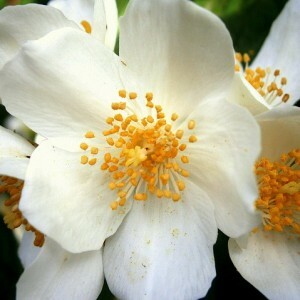 Often the mock orange is called by mistake a garden jasmine as aromas of these plants are very similar. However it is necessary to remember that actually the jasmine (Jasminum) is a thermophilic bush from the family of Oleaceae, and grows in a wild form only in the South, and in our latitudes can be grown up only in room conditions.